Home / News / Asphalt Sunscreen and Anti-Aging Regimen – WHAT? I think we are all glad the cold, rigid temperatures of the winter are FINALLY wearing off and a warm, pollen-filled, flower blooming, pool and beach visiting summer is on the horizon. Amen! And, it is HEATING up out there, y’all. The constant blaze of the summer sun is almost upon us and although we have an easy way to protect ourselves via SPF sunscreen, shade options, and UV protective wear – our asphalt and pavement does not have those luxuries and not to mention is exposed to higher traffic in the summer months. Preventing deterioration of your roads, streets and parking lots is more important now than ever. Think of the asphalt as your skin – if you don’t protect it, it gets damaged by the extreme heat and harmful UV rays. Think of sealcoating as the asphalt’s SUNSCREEN. It protects it from becoming dry, brittle, weak and from ultimately causing cracks and potholes throughout. 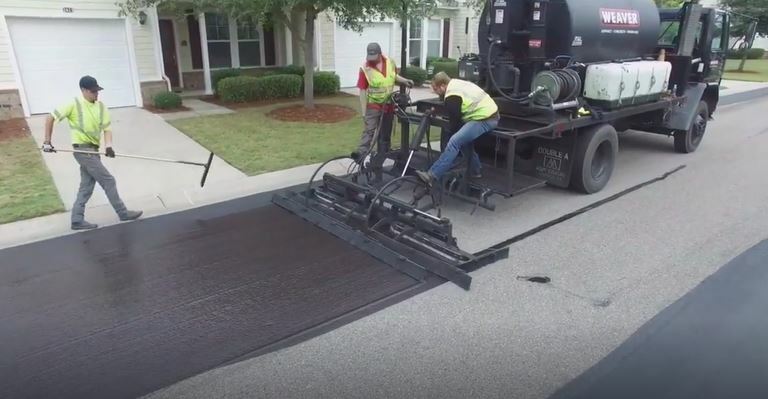 Although we can’t lather sunscreen on our roads and streets we can apply a protective barrier every 2-3 years that will prolong the life of your asphalt pavement. Sealcoating is your asphalt pavement’s anti-aging regimen. Keep your costs down by maintaining a regular sealcoating schedule and keep your asphalt looking and feeling young and vibrant. This will extend its life cycle and ultimately beautify your community, standing out from the others. Give one of our professionals a call to discuss your needs and budgetary options – 843-734-0622 or email us at bids@weavercarolinas.com.